This is even easier and there are zillions of recipes. All you need are tomatoes, (beefsteak would be good but they’re not in season in Ohio yet), basil and fresh mozzarella cheese. And olive oil. Some people say vinegar but I’ve read that no real Italian uses vinegar. I’m not Italian so I don’t know but I use EVO. Layer them with basil leaves. Drizzle olive oil over the layers and season with salt and fresh ground pepper. If you can restrain yourself from eating it immediately, refrigerate or let set for 30 minutes or so the flavors can mingle a bit. I love this salad and used to feel bad that neither my daughter or husband like it. Now, I just make them something else and eat it all myself. 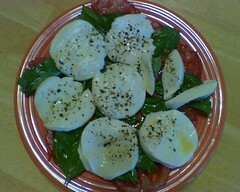 This entry was posted in Uncategorized and tagged Caprese Salad, Community supported agriculture, CSA, healthy recipes. Bookmark the permalink.